Altera has expanded its Industrial Networking Partner Programs (INPP) to provide a networking ecosystem for developers to evaluate various industrial real-time Ethernet (and fieldbus) intellectual properties (IP) for Cyclone® III and Cyclone IV FPGAs from established networking experts in the field. You can find the appropriate partner or partners to provide OpenCore Plus IP, reference designs, and specialized design services to meet your network communication and FPGA development needs. The Industrial Ethernet protocol standards supported include PROFINET, EtherNet/IP, EtherCAT, SERCOS III, Ethernet Powerlink, and Modbus TCP. Altera's partners, such as IXXAT and Softing, also support a number of fieldbus protocol standards. 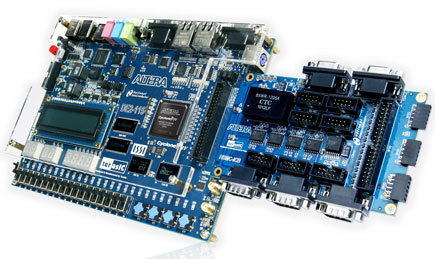 To take advantage of the flexible and programmable nature of Altera® FPGAs to evaluate and develop multiple Industrial Ethernet protocol standards on a single FPGA such as a Cyclone IV device, you can start with a modular industrial solutions platform such as the Industrial Networking Kit (INK) from Terasic. Table 1 shows a list of Altera’s industrial networking partners and the real-time Ethernet IP they support on the Cyclone IV E INK. For a full listing of IP that each partner supports on various Cyclone series FPGAs, please refer to Table 2 on Altera's Industrial Networking web page. Figure 1 shows the INK contents. 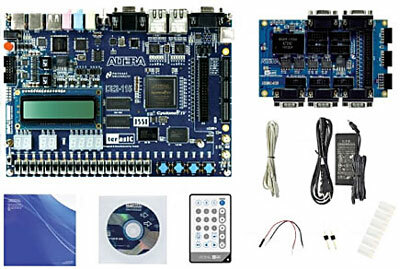 This Cyclone IV E development kit is based on the Terasic DE2-115 FPGA board (shown in Figure 2) with dual 10/100/1000-Mbps Ethernet, 128-MB SDRAM, 8-MB flash memory, 2-MB SRAM, security EEPROM (for the EtherCAT slave ID), HSMC and GPIO connectors, toggle switches and buttons, status LEDs, and a 16x2 character display, along with USB 2.0, SD card slot, audio, and video capabilities. The INK includes the ICB-HSMC board, which expands the DE2-115 board functionality with support for dual CAN, dual RS-485, and RS-232 (and Profibus) interfaces with both DB-9 connectors and 10-pin headers. The INK comes with Quartus® II software, an INK system CD, and a quick-start guide to get you up and running with the hardware. For more information on the INK and how to purchase this kit, please contact your local Altera distributor or visit Terasic’s INK web page.